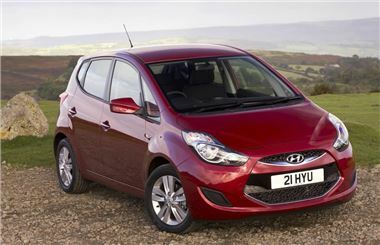 Hyundai has announced prices for the new ix20 which goes on sale from November 18. It will be available with three engine options and three generously equipped trim levels. Prices start at £11,595 for the 1.4 petrol. Buyers wanting the economy of the diesel will pay an extra £1,400. The three trim grades - Classic, Active and Style - are unique to the UK and have been carefully created to reflect the demands and high expectations of British buyers. The entry level Classic trim provides the key essentials and the interior features a height adjustable driver's seat, ESP, air conditioning, six airbags, active head restraints, radio/CD audio system with six speakers, plus CD, MP3, RDS and USB-/AUX-/iPOD-input capabilities. The next, and most popular, trim level is the mid-range Active. In addition to the Classic specification it gains a carefully-selected package of goodies that are designed to appeal to a younger family buyer demanding extra style and convenience. Externally there are 16-inch alloy wheels, body coloured door handles and mirrors (which are electrically adjustable and heated) and reversing sensors.Inside, convenience comes in the form of Bluetooth phone connectivity, electric rear windows and audio controls on the leather-trimmed steering wheel. The Active costs £1,100 more than the Classic, starting at £12,695 for the 1.4-litre petrol, £14,095 for the diesel and £14,095 for the 1.6-litre petrol auto. The range-topping Style specification adds some luxuries that buyers in the real world want, with no ‘fillers' to pad out the list. As a result, the price walk up from the Active is a very affordable £1,000. The most striking of these extras is a dual-panel panoramic glass sunroof with UV filter, which spans the front and rear seats. The front panel offers a tilt and sliding function to let the fresh air - as well as light - into the cabin. Sometimes though, you want to keep the light out, which is why the sunroof is equipped with blinds and the rear glass is super-darkened for extra privacy and protection from the sun. To further improve the looks and visibility of the ix20 Style from the outside, front fog lights are standard and the door mirrors are fitted with integrated side repeater indicators. To keep these safe on narrower roads, they fold electrically. The only factory-fit optional extra is metallic paint at £395.